Figure 17 Bishop Hill, Loch Leven from Balnethill farm. The summit is capped by quartz-dolerite of the Midland Valley Sill. The steep face is composed of Carboniferous sediments passing down into sediments of the Stratheden Group. Kinnesswood Row is the gully on the right. Figure 18 Clatteringwell Quarry, Bishop Hill. The Charlestown Main Limestone, normally an alternation of limestone and shales as seen in the foreground, is increased in thickness by 5 m on account of the massive algal reef seen in the cliff in the background. Walking distance 3.5 km of grassy hill walking with steep ascent and descent of 245 m in 800 m.
Purpose To examine (1) beds of the Knox Pulpit Formation of the Stratheden Group; (2) the Kinnesswood Formation of the Inverclyde Group; and (3) the sediments of the undifferentiated Strathclyde Group of the Carboniferous (Paterson and Hall, 1986). The last of these is less than 30 m thick on Bishop Hill, in striking contrast to a thickness of over 2000 m in the Anstruther area 38 km to the east. The highest strata exposed in the area belong to (4) the Lower Limestone Formation of the Carboniferous and these are intruded by (5) the quartz-dolerite of the Midland Valley Sill (also seen on Excursion 16). 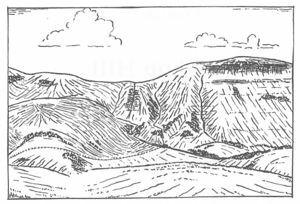 (6) The summit of the scarp on Bishop Hill affords an excellent view of the regional geology including the eastern Ochil Hills and the Loch Leven area. By A91 from St Andrews through Cupar and west across the Howe of Fife and Stratheden as far as the crossroads 3.5 km north-east of Milnathort, then follow B919 south-eastwards for 2.5 km to join A911 leading after 800 m to Easter Balgeddie. The road to Balnethill Farm lies at the south-eastern end of the village and the bus should be left at the main road. Walk up the farm road (ask permission at the farm) through the farmyard and on for 100 m to where there is an excellent view of the scarp face of Bishop Hill. The top of the scarp is composed of columnar-jointed quartz-dolerite of the Midland Valley Sill and beneath this, above the prominent gully of Kinnesswood Row, can be seen the outcrop of pale sandstones overlying the Charlestown Station Limestone. Much of the lower slope is scree covered and the farmhouse itself stands on glacial till. One hundred metres up the track behind the farm buildings enter the field on the right before walking east to a low grassy mound in the same field near the base of which soft, pale buff, fine- to very fine-grained cross-bedded sandstone can be seen. This belongs to the Knox Pulpit Formation (Chisholm and Dean 1974). Continue up the field to the gate, then walk south across the steep hillside, over more cross-bedded sandstone, to a small gate in the wall, beyond which a 4.5 m high waterfall can be seen. Here too the rock is cross-bedded, cream coloured, friable, fine-grained sandstone of the Knox Pulpit Formation. Occasional medium-grained sand grains occur and include well rounded millet-seed grains. Hall and Chisholm (1987, p. 203) identify these, on the basis of their sedimentary structures, as cross-bedded aeolian dune sands in which the paleowind was from the east. Fifty-five metres south of the waterfall is Kinnesswood Row in which mudflows occasionally occur owing to the presence of soft silty and muddy beds within the Kinnesswood Formation higher up the gully (Chisholm and Dean 1974). In Kinnesswood Row the dip of the strata is about 5° E. As a result of weathering the sandstone beds form ledges on the hillside while the softer siltier beds have been eroded back between them. The sandstones, which are often cross-bedded and feldspathic with currents predominantly from the northwest, are limonitic brown in colour and contain sporadic gritty bands and mud pellets which may be flat or rounded. Chisholm and Dean (1974, p. 17) recognised upward fining cycles. The finer-grained muddy and silty beds are often greenish in colour when exposed. Formerly included in the Upper Old Red Sandstone (Chisholm and Dean 1974) the Kinnesswood Formation has been more recently assigned to the Devono-Carboniferous Inverclyde Group by Paterson and Hall (1986), who comment on the two main lithologies present: (1) fine- to medium-grained, poorly bedded sandstone with greenish siltstones and mudstones and (2) coarse-grained, better cemented, sometimes pebbly sandstone with quartzite and vein quartz pebbles together with rip-up siltstone clasts and' cornstone' clasts (see below). Erosive bases to the sandstones occur as do fining-upward sequences. Continue up the side of Kinnesswood Row as far as a 1.5 m thick cornstone. This is light orange-brown in colour and is located 3 m below and 10 m south of the conspicuous 30 cm thick coal seam. The cornstone is sandy and gnarled in appearance and is highly resistant to weathering – pieces of it can be picked up all the way to the bottom of the gully. It effervesces readily when treated with dilute hydrochloric acid. This bed is at the top of the Kinnesswood Formation and was taken by Geikie (1900, p. 35) to mark the top of the Old Red Sandstone. There is little doubt that it is a calcrete or caliche, a fossil soil profile typical of semi-arid areas in many parts of the world today. Paterson and Hall (1986) have used the occurrence of carbonate-bearing sediments, whether calcretes or cementstones, at or about this horizon to delineate their Inverclyde Group sediments with, here, the aeolian Knox Pulpit Formation beneath and the fluvio-deltaic Strathclyde Group above. Immediately above the cornstone is a 15 cm thick coaly shale which is, however, rarely exposed. This is overlain by 3 m of poorly exposed sandstone containing large roots or Stigmaria and the 30 cm coal seam mentioned above. Browne (1980, p. 325) reported • the recovery of an undoubted Carboniferous miospore flora from a 15 cm coal near the base of the Strathclyde Group. On the evidence of the coal seam and plant fossils • there is clearly a major environmental change in the conditions of sediment accumulation from a semi-arid fluviatile one to a humid fluvio-deltaic one. This is reflected too in the abrupt fall in feldspar content in the sandstones from 20 per cent below to 1–4 per cent above (Chisholm and Dean 1974, p. 4). 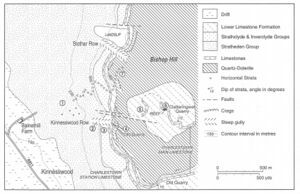 Nevertheless Paterson and Hall (1986, p. 8) tentatively place the Devonian–Carboniferous boundary at the base of the Kinnesswood Formation rather than at what seems locally a more impressive change. The Charlestown Station Limestone, though it is no longer exposed in the quarry at the top of Kinnesswood Row, can be examined 25 m north and about 6 m lower on the hillside where its brown weathering and grey crystalline interior serve to distinguish it from the adjacent sandstones. The limestone crops out lower on the hillside because of a series of E–W faults which cut the outcrop and successively downthrow to the north for a total of about 9 m.
Above the quarry at the head of Kinnesswood Row it will be seen that the exposed sequence, which extends up to the base of the Midland Valley Sill, consists predominantly of sandstone with minor shales, seatearths and some apparently tuffaceous sandstone. CARE should be taken when examining these outcrops because footing is not good and blocks of the sill are easily dislodged. The sediments have been thermally metamorphosed beneath the base of the sill, the topmost few metres of the sandstone having been altered to quartzite and the shale band bleached and hardened. The base of the quartzdolerite sill is chilled against the underlying sediment, but no fresh specimens of the chilled margin are available. A few metres higher up, the sill shows crude columnar jointing and spheroidal weathering. Now continue north-eastwards obliquely up the hillside for a few metres to join a grassy track that ascends to the top of the scarp and follow the track for 180 m to an old quarry in the Charlestown Main Limestone. 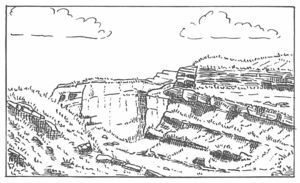 Note that the sediments in this quarry lie above the sill. In the quarry 4 m of dark grey shales, the basal 2 m with common carbonate nodules, overlie the limestone of which only the top 50 cm are exposed however. The shales are moderately fossiliferous yielding Spirifer, Productus and rarely goniatites. Looking south from the quarry the scarp formed by the E–W faults which cut the Charlestown Station Limestone on the face of Bishop Hill can be seen. The quartz-dolerite sill is faulted against the overlying sediments of the Lower Limestone Formation and stands up prominently on the southern or upthrow side of the fault. Near the north-western end of the quarry face a reef of massive limestone up to 5.0 m thick occurs within the top thinly bedded limestone. The shaly limestone has been stripped off over a short distance to reveal the form of the reef which appears to be about 50 m wide and elongated 10° E of N. In thin section, however, little structure is visible in the reef rock; indeed the only fossils visible are crinoid ossicles and these have been recrystallised, and it seems probable that the reef builders were largely algal: certainly corals are rare. The rock is recrystallised lying as it does only a few metres above the major Midland Valley Sill. The succeeding shaly limestone is also recrystallised, fossils often weathering out. They include the brachiopods Spiriferand Productus together with Aviculopecten and Fenestella. Shales overlying this are exposed a few metres north-west of the reef. Fossils are most easily collected from the spoil heaps. At the south-eastern end of the quarry the dip of the strata is about 12° S, but no higher beds are exposed. Again the rocks are baked by the underlying sill the limestone is recrystallised and the shale hardened so that the fossils now weather out. One hundred metres north-west from Clatteringwell Quarry cross the wall at the gate and continue in the same direction to the scarp edge from which, weather permitting, there is a fine view to the north and west. The hills of North Fife and the Eastern Ochils from 6.5 to 16 km away are composed of Lower Old Red Sandstone lavas and tuffs belonging to the Ochil Volcanic Formation and dipping south-east at 15° thus presenting their dip surfaces to the viewer. 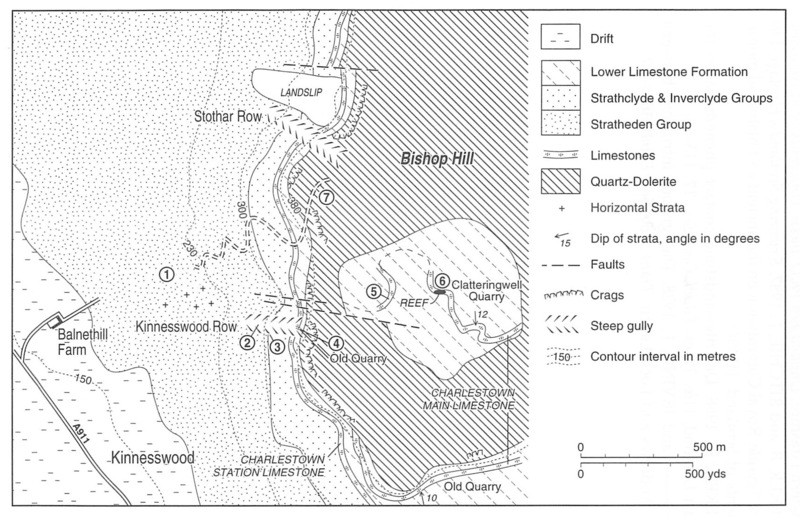 The lavas dip unconformably beneath the almost horizontal sediments of the Upper Devonian Stratheden Group which in turn pass up into the Devono-Carboniferous Inverclyde Group and the Strathclyde Group of the Carboniferous on the face of the Lomond Hills and Bishop Hill, there to be capped by the quartz-dolerite of the Midland Valley Sill. To the west Loch Leven occupies what is believed to be a very large kettle hole. It is surrounded by extensive fluvioglacial deposits and glacial till. To the south of the loch Benarty is also capped by the Midland Valley Sill and to the south-west the Cleish Hills display the same sill, much broken by faults, together with Lower Carboniferous sediments and volcanics. During the later stages of the Devensian glaciation of the area east-flowing ice is thought to have divided round the Lomonds–Bishop Hill massif, one branch flowing down the Firth of Forth to the south and the other down Stratheden to the north. Now take the rough track which zig-zags down the face of Bishop Hill, noticing on the way the good view of Kinnesswood Row and the geological features seen on the way up the hill, especially the sill. The track ends in a field 350 m behind Balnethill Farm. Return to the bus and then to St Andrews by retracing the outward route. BROWNE, M. A. E., 1980. Stratigraphy of the Lower Calciferous Sandstone Measures in Fife. Scot. J. Geol., 16, 321–8. CHISHOLM, J. I. and DEAN, J. M., 1974. The Upper Old Red Sandstone of Fife and Kinross: a fluviatile sequence with evidence of marine incursion. Scot. J. Geol., 10, 1–30. HALL, I. H. S. and CHISHOLM, J. I., 1987. Aeolian sediments in the late Devonian of the Scottish Midland Valley. Scot. J. Geol. 23, 203–8. PATERSON, I. B. and HALL, I. H. S., 1986. Lithostratigraphy of the late Devonian and early Carboniferous rocks in the Midland Valley of Scotland. Rep. Br. Geol. Surv). 18, No 3. This page was last modified on 23 February 2019, at 14:32.